The aphids were a hit at Carleton’s Summer Research Symposium. At the Carleton College Summer Research Symposium on October 26th, I presented a poster on my work on the aphid addition/exclusion experiment. 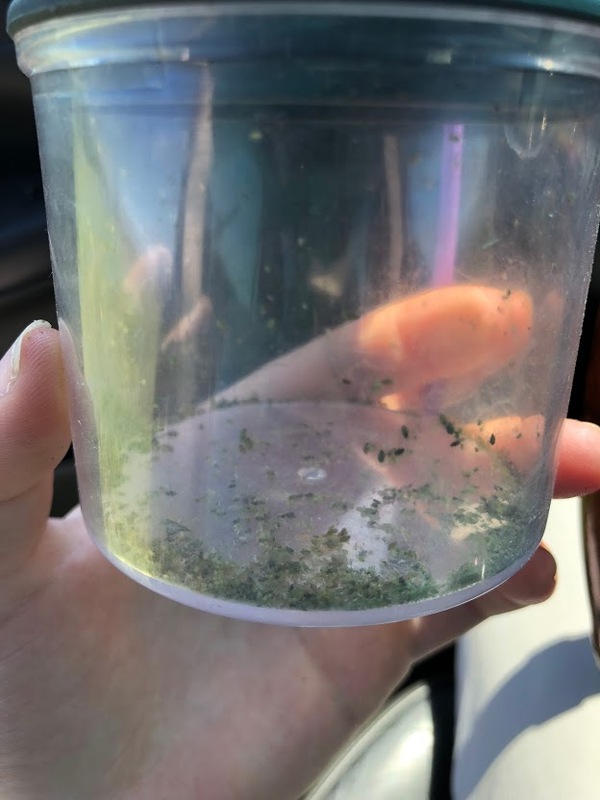 Over the summer, I administered the aphid addition and exclusion treatments for the experiment and collected data on leaf senescence and herbivory on plants in the study. Since August, I have been developing an aster model in R to analyze differences in fitness between these two experimental groups. Preparing the aster model for my project was quite a bit of work, but I learned more about R, statistical analysis, and plant-herbivore interactions in the process. Interestingly, Aphis echinaceae has not had an impact on plant fitness over the 8 years of the study. I am excited to see how the experiment progresses in the coming years, and how the addition of data on seed set affects the results of future fitness models. Quite a few visitors to the symposium were also interested in the results of my analysis and my experience working with the aphids. It was a pleasure to represent the Echinacea Project at Carleton and to have a chance to share the fantastic work the team did over the summer. This morning the much-diminished Team Echinacea (Stuart, Kristen, Lea, Michael, and I) gathered at the Hjelm house to start the day. 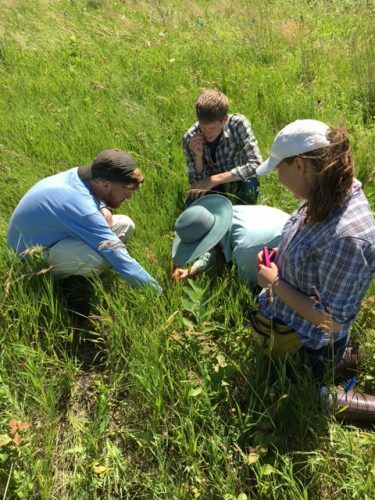 Lea went to Staffenson Prairie Preserve to measure the flowering phenology of Liatris and Solidago plants. Michael and Kristen began to prepare experimental plot 8 for management in the coming year. The team will treat rogue Ashe trees and collect and broadcast the seeds of several prairie plant species in this plot. This is part of an ongoing effort to ensure that the plant community within the plot is consistent throughout. Meanwhile, I assessed the leaf damage and senescence of plants in the aphid addition/exclusion experiment in p1. This was the final component of the fieldwork involved in this experiment for the season, and the last step in my independent project before I begin statistical analysis. The next step is to gauge fitness differences between plants in the aphid addition and exclusion treatments by constructing an aster model. While it was exciting to finish this aspect of the project, I will miss spending time with my Aphis echinaceae friends. Over lunch the team prepared for inclement weather by sharing our experiences of intense weather events. After that, Kristen presented an update on her master’s project. She shared some intriguing preliminary results about the nesting preferences of native ground-nesting bees. We are all looking forward to the results of her study! Due to the rainy weather, the team was ready to call it a day after Kristen’s presentation. We held a short meeting to plan next week’s schedule and then headed home for the weekend. This summer Team Echinacea continued adding and excluding aphids to plants in the experiment that Katherine Muller started. 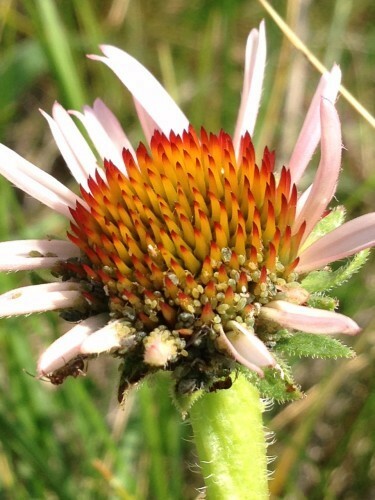 In 2011, Katherine Muller designated a sample of 100 Echinacea plants in experimental plot 1 for aphid addition or removal. The presence or absence of these aphids was maintained by team members once a week in the summer of 2017, for a total of 7 weeks from early July to mid August. We maintained addition on 31 plants and exclusion on 30, for a total of 61 plants. Will Reed set up a data entry system where we could enter data twice from the paper sheets and check for data-entry errors. In early October, Lea Richardson and Tracie Hayes recorded signs of senescence in the leaves of treatment plants. This data can be combined with data from our common garden measuring data to explore the richness of the Echinacea-aphid relationship. You can read more about the aphid addition and exclusion experiment, as well as links to prior flog entries mentioning the experiment, on the background page for this experiment. 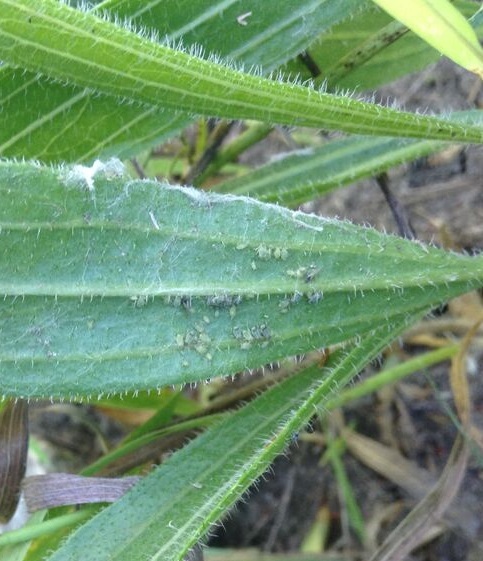 Aphis echinaceae is a specialist aphid that is found only on Echinacea angustifolia. 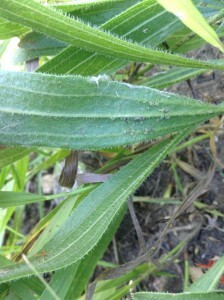 It feeds on sap in Echinacea leaves, and can also be found on flowering heads. This aphid also attracts “ant bodyguards”, which protect the aphids from predation, and in the process may also fend off other potential herbivores. 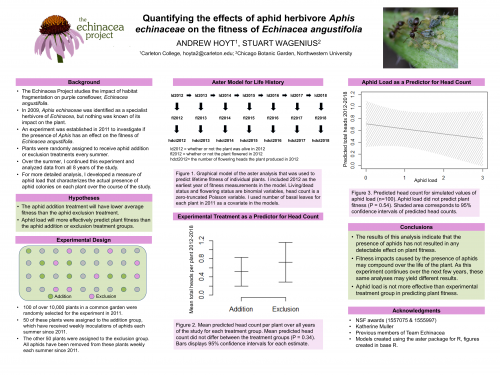 Prior studies by Team Echinacea members have demonstrated that aphid presence does not lead to significant changes in plant fitness in observational studies, although in controlled experiments aphid presence does affect herbivore damage. Furthermore, inbred plants are more susceptible to aphid presence than outbred plants. In 2011, Katherine Muller designated a sample of 100 plants in experimental plot 1 for aphid addition or removal. 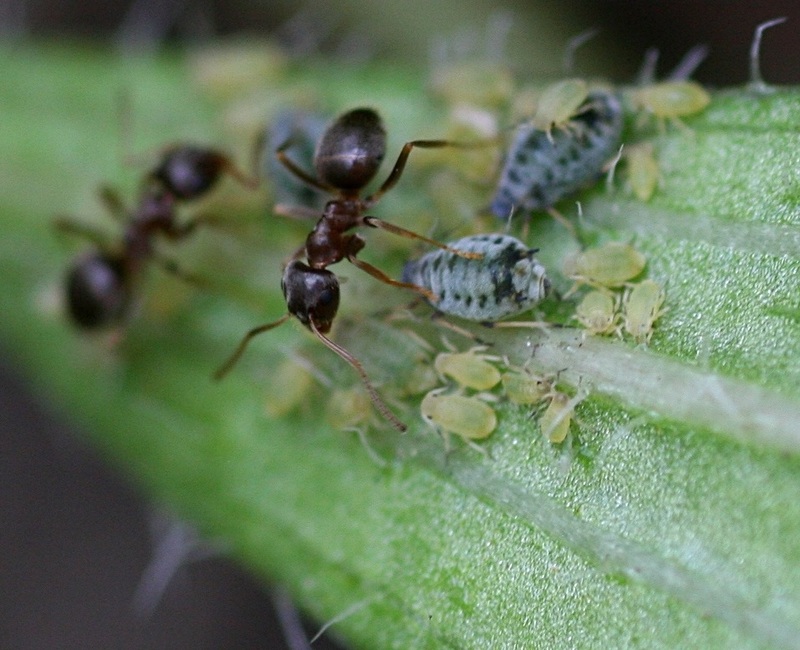 The presence or absence of these aphids is maintained by team members two to three times per week. 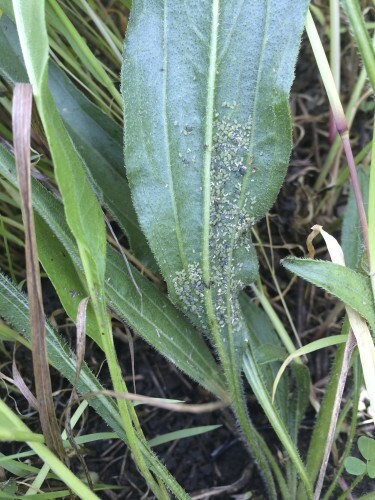 In summer 2016, aphid levels were assessed and maintained 14 times on 70 of these plants (addition on 33, exclusion on 37) from early July until early August. In September, Amy Waananen recorded signs of senescence in the leaves of treatment plants. This data can be combined with data from our common garden measuring data to explore the richness of the Echinacea-aphid relationship. We met a half hour early today so we could do pollinator observations during what we thought would be their peak time. We were wrong. Hardly any bees were out and about on this very windy morning. Everyone finished around 10:30 and we met down in P1 to weed the birdsfoot trefoil. 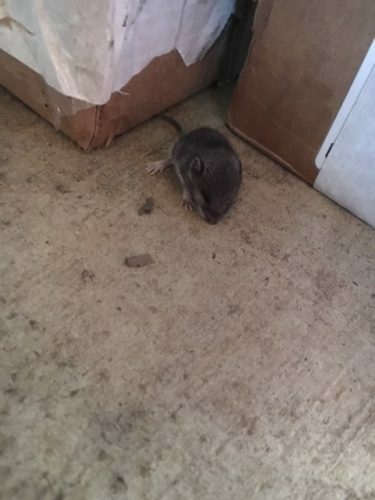 This little mouse greeted us in G3 this morning. The lunch table was very crowded today as we had a number of special visitors. Ruth Shaw, Dan (a grad student from U of M), and Amy and Brad Dykstra all came to help out. They also brought yummy chocolates and muffins for a lunch treat. After lunch, everyone set out different ways. Some people went GPSing and some went to catch pollinators. I got to stay back to teach Lea, Scott, Alyson, and James my special talent, aphid exclusion and addition. Last summer, I worked a lot on the aphid project so it was a lot of fun to do again! Alyson even sang to the aphids to sooth them into their new homes. Roxy saw how much fun we were having and decided to join us for awhile in P1. We found 70/100 original addition/exclusion plants, including 33/50 addition and 37/50 exclusion ones. Here’s some aphids I found on a collection plant in P1. Team members learning the ways of aphids. Today I also took my first trip to the infamous bog with Alyson and James! Roxy, the bog dog, took me on a wonderful tour of the place. On our way up, we stopped to pet the goats. Alyson trying to escape the treacherous bog waters. 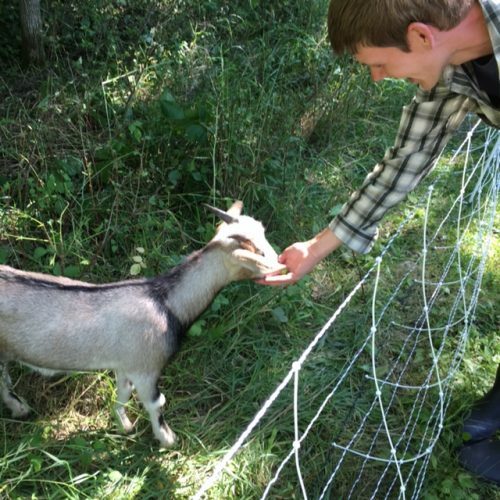 Scape Goat eats out of James’s hand. Over the course of four Wednesdays spread throughout November and October, we in the Echinacea lab were fortunate enough to have two students from Lake Forest College’s plant biology course. These students, Daniel and Kyle, looked at this year’s (2015) flowering plants that were in the aphid addition and exclusion experiment. They dissected, scanned, counted, and x-rayed the seed heads to determine seed set in these plants then made a poster and did a presentation for their class. It was wonderful to have them here and their contribution to the Echinacea Project will be very useful as we move on with the aphid addition and exclusion experiment. You can find their poster here. 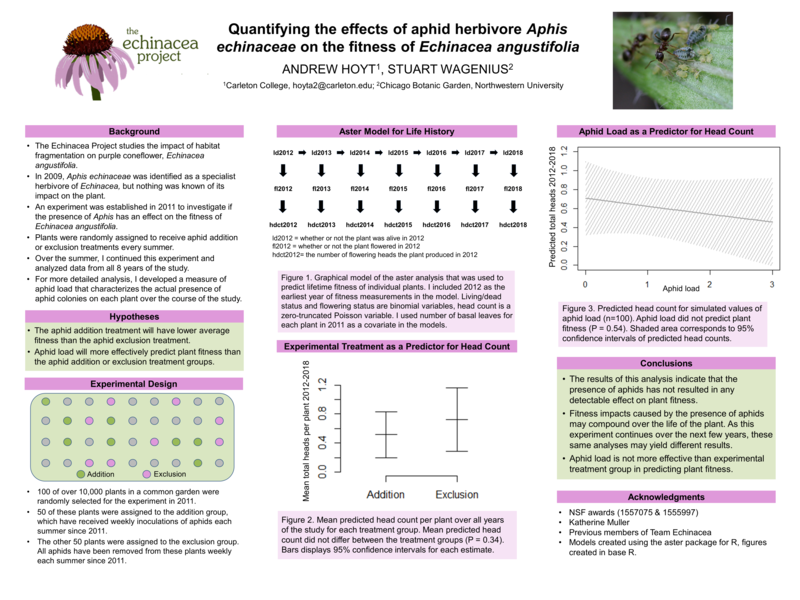 This summer, Gina Hatch and Abby VanKempen continued a project examining the effects of aphid herbivory on Echinacea angustifolia survival and fitness. This year they found 70 of the original 100 study plants (33 addition and 37 exclusion). Starting July 14th going until August 20th, Abby and Gina visited plants twice each week for a total of 12 visits per plant. 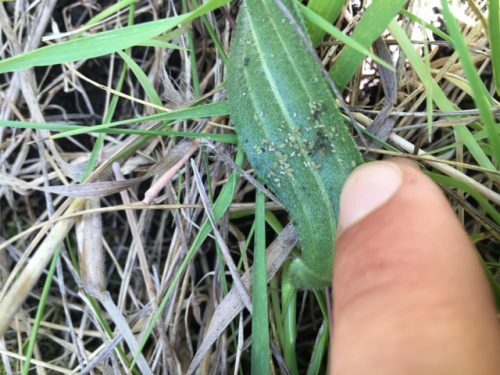 On each visit, the plant received its treatment: either adding aphids from other plants if it was in the addition group or removing all aphids if it was in the exclusion group. 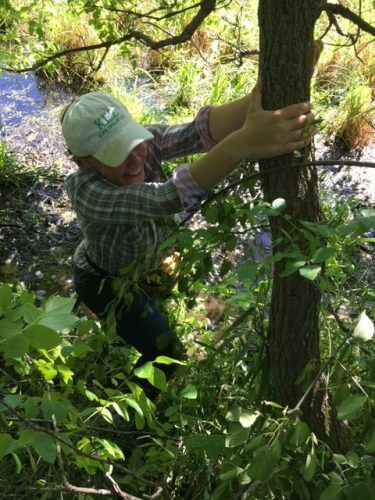 At the end of the summer, Abby and Gina used the number of leaves with chew marks and holes (signs of foliar herbivory) to quantify herbivory. There was not a significant difference in herbivory between the two treatment groups, where herbivory was measured as the proportion of damaged leaves (p = 0.74). On September 14th and October 15th, Ali Hall took measurements of senescence including number of brown and purple basal and cauline leaves. These have not yet been incorporated into an analysis. Read more posts about this experiment here. Products: Fitness measurements were collected during our annual assessment of fitness in P1. A list of focal plants and addition/exclusion datasheets are located in Gina Hatch’s Dropbox folder and can be found here. Gina created a poster and presented at Carleton’s summer research symposium and her poster can be found here. Abby plans to present at the Elbow Lake Library. The senescence data can be found here. Gina made a poster for Carleton’s summer research symposium. The symposium happened a while ago but you can relive the experience by looking at her poster!